I just really enjoy twitter chats, alright! It’s a lot of fun to talk to people and there is an undeniable sense of satisfaction when twitter keeps updating with push notifications and you feel really good about yourself. Or maybe it’s an introvert thing, I’m not really sure. I had joined a twitter chat a few days ago where the subject had been about blogging (as usual) and one of the questions was “Do your friends/family know that you blog?”. My answer to that question would be a little complex. Here’s why. When I started this blog (my official blog, as I like to call it), I wanted it to be filled with quality posts. You know, those posts that have great photography and editing and a lot of interestingly written content and pretty aesthetics and make you think “Hey! This is pretty cool! I like it!”. Is my blog there yet? And that’s okay! This is a goal I’m slowly but surely working towards. There are days when I have no idea what to write and I end up writing things in a hurry and I have this nagging feeling that my readers can tell I was in a hurry- because I put an emphasis on schedule. Come what may, The Lunar Descent will be updated. See a new post up every Monday and Friday. Even if the content isn’t that good. This is one reason I am reluctant to share my blog with friends and extended family. I am a bit of a perfectionist and I have this mindset that other people expect perfection from me as well. My blog is far from perfect. There are things scattered all over the place, blog posts I need to rewrite, labels I need to fix. Yes, I’m working on it. Sometimes when I go through different blogs and Instagram accounts, I notice that some blogs have an enormous following with very little engagement. I wouldn’t call these extra numbers ‘ghost’ followers or ‘bought’ followers, but maybe ‘polite’ followers. You know, the kind of people who just have to follow you because it’s the socially acceptable thing to do. Like how all your friends will add you on Instagram. And you are obliged to follow them back. Even if your feed is terrible and vice versa. The thing is, I don’t want people to follow me just because of common courtesy or because they feel obliged to, or just because they know me. ME. Whether I’m a friend from high school, or a current classmate, or a second cousin or a friend of a friend- they’re following just because they know who I am. The quiet girl who doesn’t say a single word in class. The same person who seems pretty mundane. Let’s see what someone like her could possibly be blogging about. Now there’s two outcomes of a sharing scenario. Either people will follow me to monitor my blog and see what I’m up to, what I’m thinking about, what I’m writing, who I engage with, what I post on social media, how many comments I get, how many followers I have. Has she written about me somewhere? Did she talk about that fiasco that happened the other day? Maybe she’s decided to write an opinion she’s too scared to say out loud herself. The other outcome could be something along the lines of indifference and perhaps disappointment. I mean, there’s a lot of other bloggers out there too who write things that are far more interesting to read and entertaining to talk about. I don’t post much about make up and product reviews or recent movie or tech releases. What’s the point of following this blog? If only this was like Buzz feed. Where are all the GIFs? There’s no tips on how to lose weight or be smart! I’m still thinking about whether I should come out with my blog or not. I’ve asked around and got a very positive response, encouraging me to share it, mostly from my friends. As for my family, my parents and siblings and select cousins know about the blog. They’ve also given mostly positive feedback but I still can’t quite make myself bring this blog to light. I’ve seriously made efforts towards it though. I asked a friend to design the blog header for me and also sat down to work on social media buttons on the side, trying to improve the overall visual experience of the blog. I’m hoping things get to exactly how I want this blog to look (aesthetically at least) with in a week. What do you think? 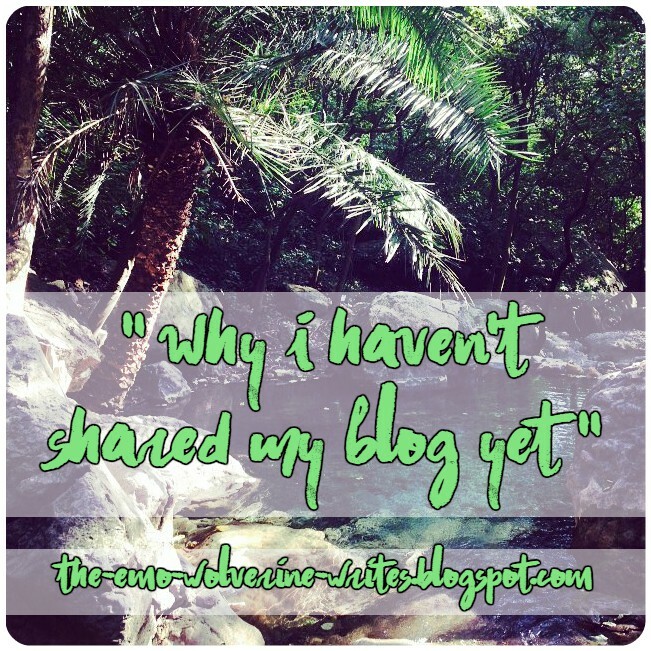 Do your family and friends know about your blog and blogging habits? Why or why not? What advice would you give me? Have a nice day! Careful What You Write in YA Books! !